As with a lot of barbecue, brisket has humble beginnings. In the days before refrigeration, butcher shops in the US would often incorporate smokehouses to preserve meat and this technique gradually evolved into today’s familiar barbecue. 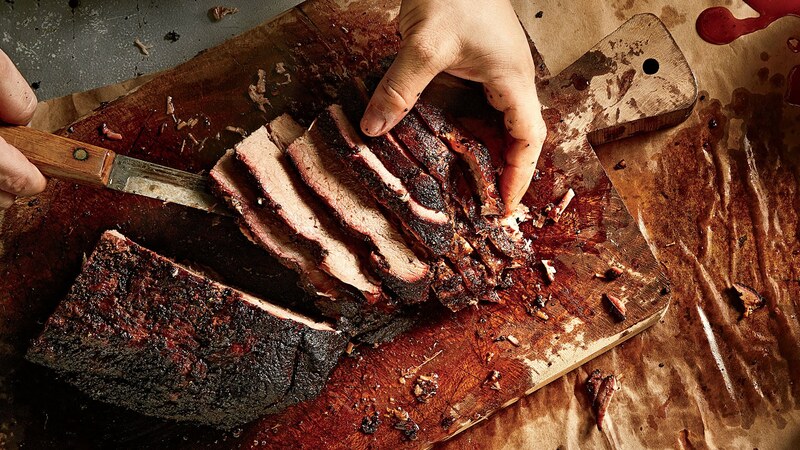 Brisket has now transcended its geographic origins and any self-respecting joint calling itself a smokehouse will have slow-smoked brisket on the menu. Given the time required to turn it from a tough, chewy, unremarkable piece of meat into the juicy, smoky, melt-in-the-mouth end result, as well the sheer size of a whole brisket, it can be quite intimidating when starting out. On the other hand you only really have three variables to adjust – the fire, the rub and the meat itself. 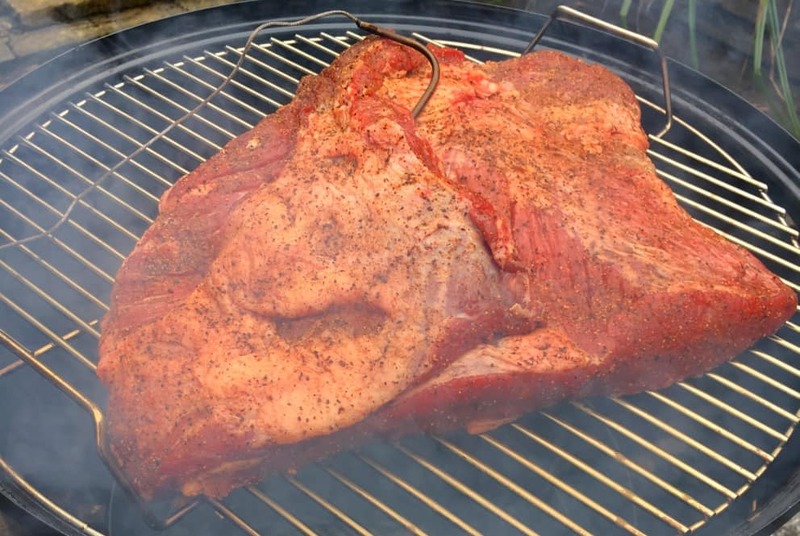 Take a read through this guide which condenses many hours of research and practice into a handy introduction to smoking brisket. It really is worth the effort to have a go yourself, particularly for the added satisfaction that comes from devoting a day’s work to your dinner. With big cooks like this, I highly recommend keeping notes of where the meat was sourced, how it was prepped, what rub was used along with a log of the meat and cooker temps throughout. It will really speed up learning and help identify how changing certain elements affects the final result. One of the keys to brisket is cooking it low and slow. Everyone’s heard the phrase, but what do we actually mean? Well, low temperature for a long time and, for this, you’ll want a cooker with a few specific characteristics. Firstly, it needs to be the right size. A whole packer brisket is a big piece of meat and there needs to be sufficient room inside for the air and smoke to circulate. Depending on the cooker type you may also want space for a water pan. To maintain a low temperature you want a controlled flow of oxygen. Check the vents to see how airtight they are when fully closed, and keep an eye out for extra (unintended) gaps in the cooker that will allow oxygen in and keep your fire burning hotter. The more heat that’s retained by the cooker itself, the easier you will find it to keep a consistent temperature for a long time. Budget cookers tend to scrimp on the thickness of material to keep costs down so look for the most heavy duty within your budget. Check out this post on the different types of cooker you can use. Check out the Tools section for the basics. Wood(chips) – Oak or Hickory are good choices. 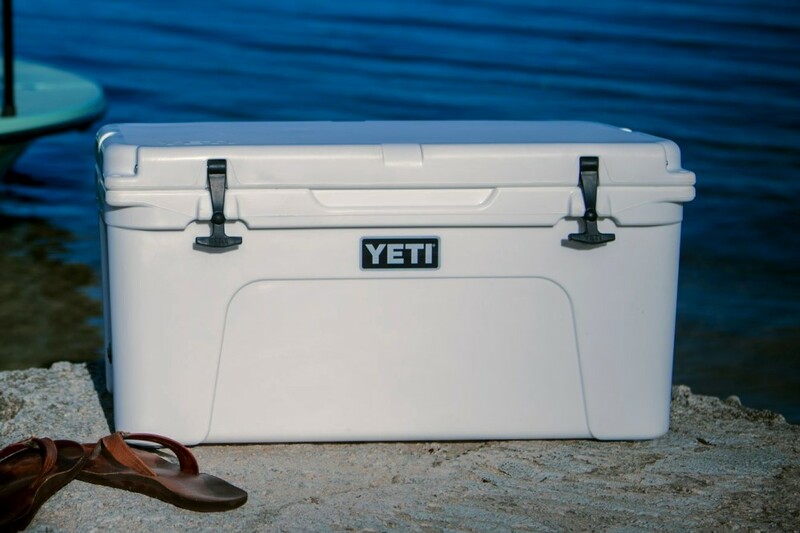 A cooler / ice box. The brisket comes from the cow’s forequarters and does a lot of work supporting the animal’s not-inconsiderable weight, resulting in a piece of meat that was generally not held in high regard due to its inherent toughness. Weighing between 10 and 20 pounds, a whole brisket actually comprises two muscles – the thinner, leaner flat and the more marbled, fattier point. 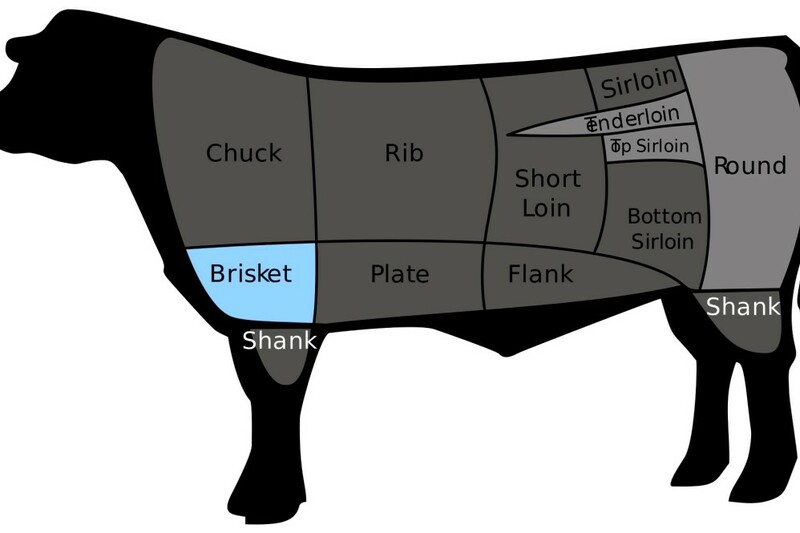 Most meat labelled as brisket in the UK is trimmed flat, often rolled into a roasting joint which is next to useless for replicating your smokehouse favourite. It’s near impossible to get hold of a whole ‘packer’ brisket without striking up a relationship with your butcher but this is well worth doing. If you’re going to invest a big chunk of money and time into the process it makes sense to know what you’re getting. Look for decent fat marbling which will be particularly evident at the end of the flat. If this looks good you can be confident in the rest of it. While you also want a nice even layer of fat across the top, try and avoid big chunks of hard white fat which will just need trimming. Buy the best quality meat you can and, if you want a smaller commitment you can always go for a half brisket – just make sure it’s the point half as a flat on its own is very tricky to keep moist. 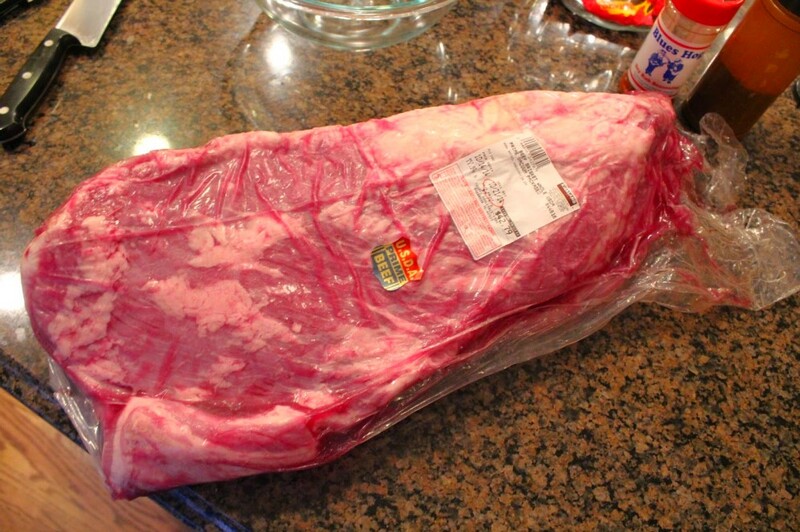 There’s nothing too complicated about prepping a brisket for cooking. In fact, even the traditional ‘Dalmation’ rub is simply equal parts salt and pepper. The aim is to let the meat and the smoke do the work. Whatever cut of brisket you intend to use, give it a check over and trim off any loose scraps as they’ll only burn. Then trim the fat cap to be around a ¼ inch and as even as possible. If you have a whole packer cut, you will likely find a couple of chunks of fat that should be trimmed as they won’t render properly. If the end of the flat is particularly thin it’s also worth trimming this off and squaring it up as it will also help when it comes to slicing the finished article. I tend to stick (almost) to the traditional rub approach but with a dash of smoked paprika for colour and and a pinch of sugar to assist the formation of a nice crusty bark. 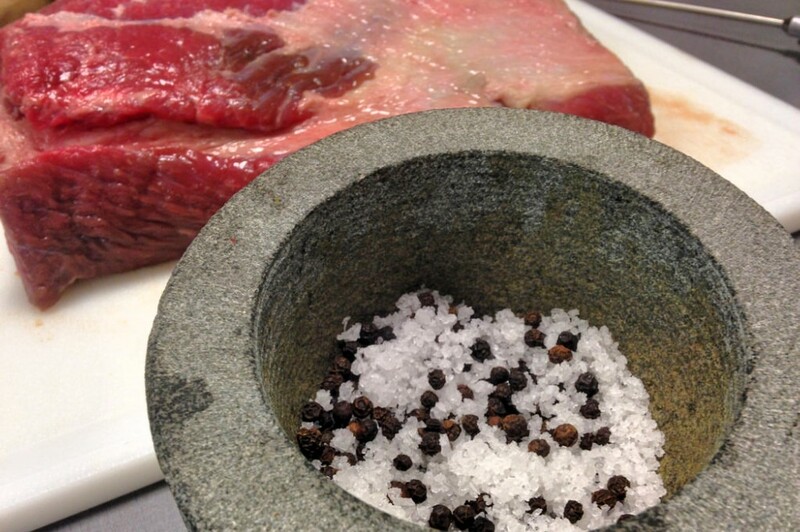 Have a read of this article about salt in rubs and dry brining. Aim for around ½ cup for a whole brisket. At this point you can also inject the meat with stock, Worcester sauce or even a bespoke marinade. This isn’t the traditional approach but can help keep things moist, especially when working with a particularly lean cut. 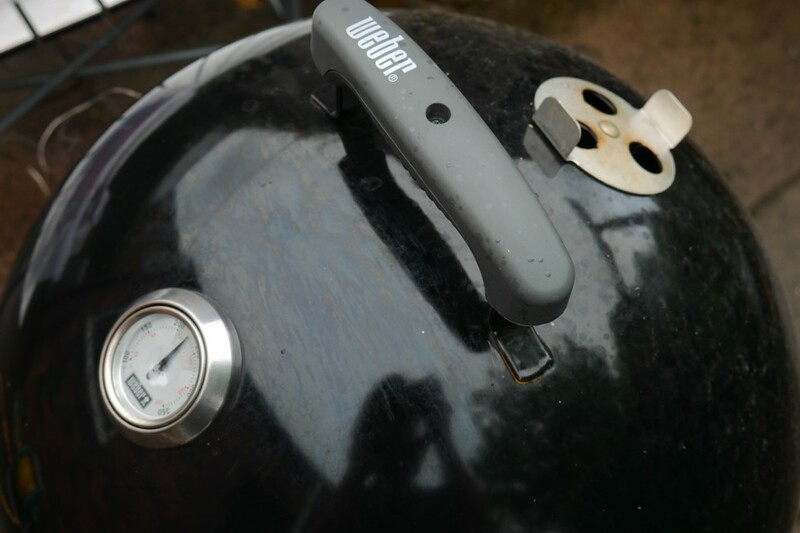 Light your fire and get your smoker up to temperature before adding your brisket. 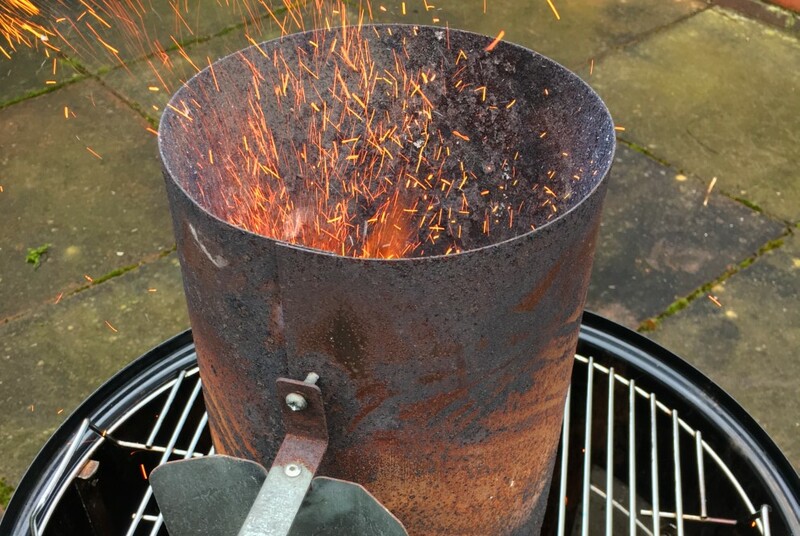 If you are using charcoal in a bullet smoker I recommend the ‘Minion’ method to get started. 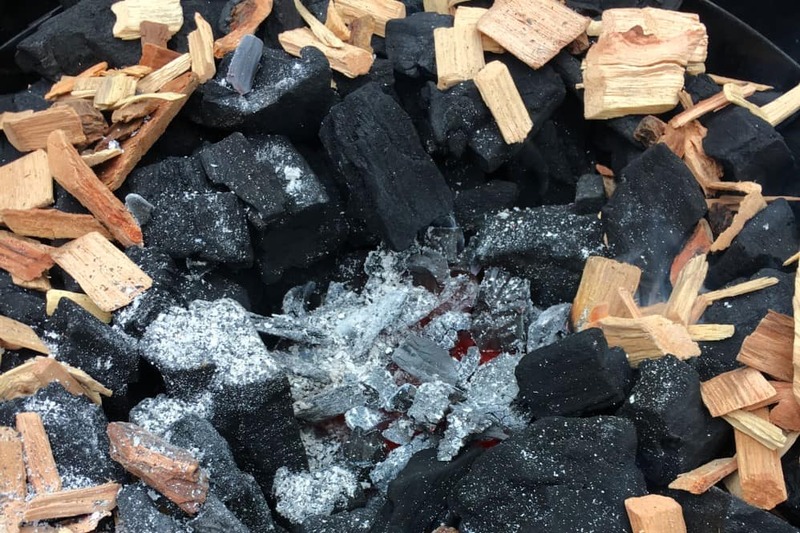 Unless you are using an offset smoker with wood, you should add a few handfuls of woodchips amongst the charcoal and don’t forget to fill up a water pan. Various recommendations suggest anywhere from 220-280F for the cooker temp and I tend to stick somewhere in between. Many claim that a good brisket depends on keeping an absolutely constant temp throughout cooking, but I don’t believe this to be the case. A conventional oven usually varies in temperature by +-20F from the setpoint without any dramatic consequences in the final result so, while you should have a target in mind, don’t stress too much if you diverge at times. More important is an accurate read of the actual temperature so use a probe thermometer, if your cooker has access, rather than relying on any inbuilt dial. Insert a probe thermometer into the thickest part of the meat, pop it in the cooker and sit back for a while! Approximately 1 to 1.5 hours per pound of meat or, more precisely, until the internal hits your target, which should be around 195-203F. A deliciously tender brisket will be moist because of the fat rendering over many hours of cooking rather than just the water content of the meat. It’s for this reason that you should aim for the 200+F internal temperature target even though it feels like you might be drying out the meat over such a long time. Just make sure you keep the cooker humid with a water pan. There are two main aspects to be aware during a cook. The first is the stall where, after rising rapidly over the first couple of hours, the internal temperature literally stalls at around 170F. While disconcerting, this is perfectly normal and you can read more here. Secondly, you have a choice of whether to wrap the brisket or not and, if so, at what point. While not essential, the main effects are to retain moisture and speed up the cook, particularly helping to push through the stall. Given that it creates a barrier around the meat, it also prevents the smoke reacting with the meat while protecting it from excess heat. As such, I like to wrap a couple of hours into the stall once the bark is looking nice and dark and crusty and doesn’t require too much more smoke effect. 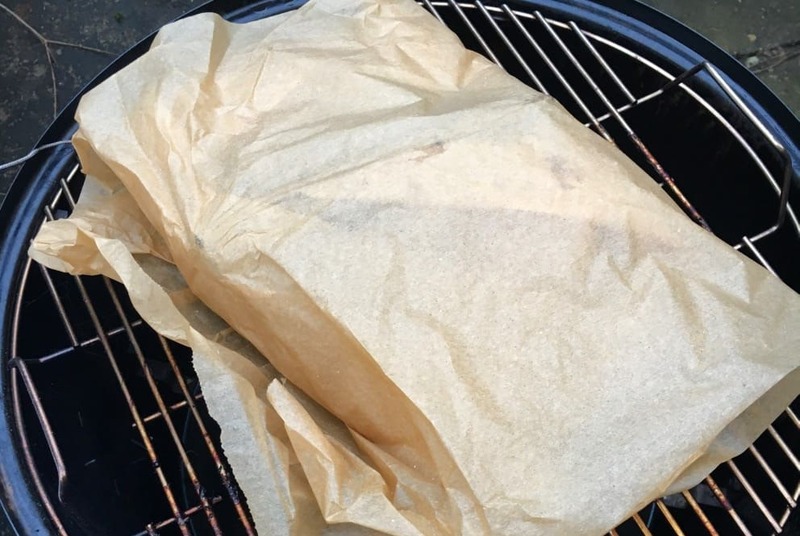 I use greaseproof paper over aluminium foil so that it’s a slightly more permeable barrier. Once you finally hit your temp target it’s still not time to eat. It’s important to let the meat rest for at least an hour after you take it off the cooker to allow the moisture to be re-absorbed. Cutting into a brisket hot off the smoker will look juicy but it will dry out almost immediately. 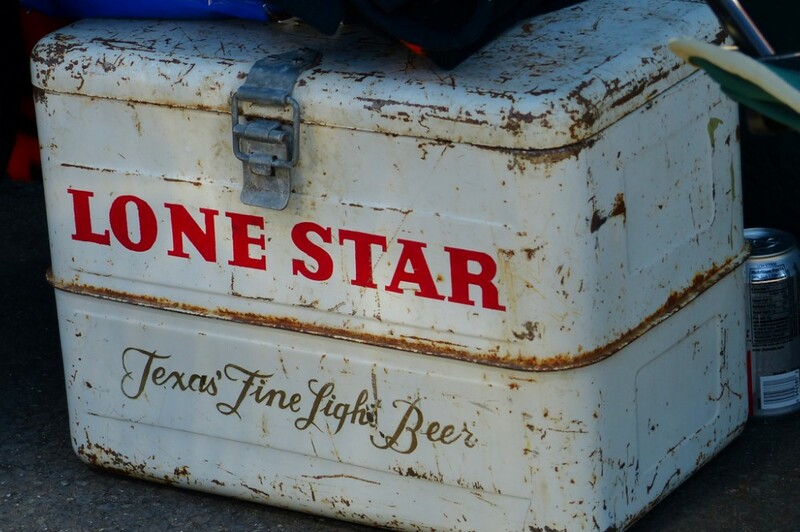 Instead, put the still-wrapped brisket on a tray in the bottom of an ice chest and leave it with the lid loosely fitted while you work on your side dishes or crack open a cold one. When it comes to slicing there are a few things to remember. Generally it’s preferable to cut against the grain – so in line with the end of the flat. Slices should be around a quarter inch thick and, if you’ve got it right, should hold their own weight but pull apart with almost no effort. If you start at the flat, the end cut is a good barometer of how well your brisket turned out. Make notes on the flavour, texture and tenderness and you can make adjustments for next time. As you slice you will work through the lean part until you reach the point – the fatty section. The flat continues for a while underneath, separated by a layer of fat and finally, at the point end, you have the burnt ends. These will likely disappear pretty quickly! 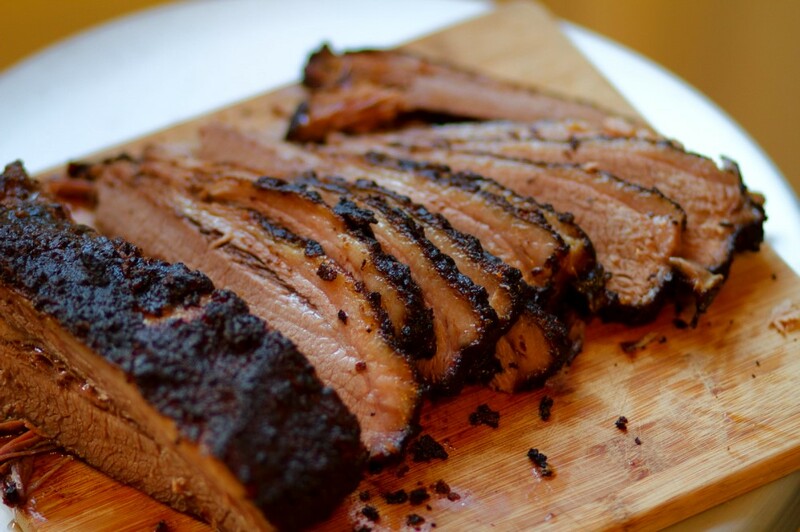 Traditionally brisket is served without barbecue sauce because, when it’s been done well, it simply doesn’t need it. Some basic potato salad, coleslaw and pickles go well and the classic Texas accompaniment is plain ol’ sliced white bread. Go easy though, you’ll easily fill yourself up on brisket alone. If it didn’t turn out perfectly don’t despair – you can shred the leftovers and use them pretty much anywhere you’d use minced beef for an amazing smoky twist on many dishes. Brisket chili is a particular favourite. While I recommend getting in touch with your local butcher, you can always get yourself a variety of briskets online. Don’t listen to me, see what a true expert has to say with Episode 1 of this great series with Austin’s Aaron Franklin. Enter your email below to subscribe to my newsletter. © Riley Barbecue. All rights reserved.